Armed with a passion to ignite opportunity, three women were the driving force behind starting South Africa’s smallest university a decade ago, despite a lack of government funding. Statistics SA reported in June this year that “the unemployment rate among youth (aged 15 to 34) has increased from 32.7% to 36.1% between 2008 and 2014”. To address the growing number of unemployed youth in our country, a team of women selflessly created an empowering learning environment exclusively for students from disadvantaged backgrounds to give them the chance to find and make use of opportunities in business. Ten years after starting what they describe as “but a dream”, Adri Marais, Gia Whitehead and Leigh Meinert – the founders of South Africa’s smallest university, the Tertiary School in Business Administration (TSiBA) – are driving their mission statement, “to be an innovative learning community that graduates entrepreneurial leaders who ignite opportunity and social change” – to ignite opportunity and provide an experiential learning environment focusing on business skills development and personal growth. Marais (previously the dean and the current CEO) and Whitehead (responsible for fund-raising and sustainability) spoke exclusively to Achiever about the challenges and achievements of the past decade – and about the role women can play in business and leadership. Whitehead says TSiBA was founded 10 years ago in the context of the growing youth unemployment problem, with academic offerings designed to enable talented young matriculants from poor backgrounds to access tertiary education, succeed in their studies, access employment, postgraduate education and/or start their own business, and to ignite social change and opportunities for others as well. “The strategic choice was to target matriculants from poor schools who did not get grades that were good enough to access traditional universities and/or did not have the funds to study further. To date, we have successfully produced a number of students who have received prestigious scholarships. Five of our graduates have been awarded Mandela Rhodes Scholarships, the most prestigious scholarship for postgraduate study. “No other university in South Africa has consistently achieved this level of Mandela Rhodes scholarship awards. Two current students are Allan Gray Orbis Fellows and two graduates are Kofi Annan (Business School Foundation) Fellows studying toward master’s degrees in Europe,” Whitehead tells Achiever. According to her, South Africa remains a country in which the wealth–poverty gap is extremely wide, with significant political and economic impacts and conflicts as a result. “Going forward, it will be necessary for businesses to operate successfully, but also to do so in a way in which an enhanced level of balance is achieved across social, manufacturing, financial, natural and human resource capital platforms,” she adds. 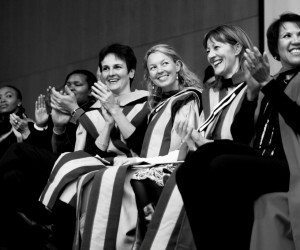 By attracting a number of local investors, together with educators who have stepped up as volunteers to produce a calibre of students who embody self-awareness and an understanding for current business needs, both globally and internationally, the women have successfully managed to sustain their institute. Being a socially conscious establishment, Marais and Whitehead say they go beyond training and that they allow students to get actively involved in business and entrepreneurship. For this reason, they have established their Ignition Centres, which see to exactly this task. The mission of the Ignition Centres is to be an innovative mentoring community that develops confident entrepreneurs who earn sustainable livelihoods, create jobs and drive economic and social prosperity. “Most micro entrepreneurs view the availability of startup capital as a non-negotiable starting block in the establishment of a business. We disagree, and view it as the last element in the establishment of a viable business. Therefore, we do not act as a credit provider, but effectively facilitate introductions where appropriate,” Whitehead says. They also place a unique focus on skills development, knowledge and attitude, which has been designed to enable talented and ambitious South Africans to overcome the gap between rich and poor. According to Whitehead, they aim to do more than offer a bridge to becoming economically active. She says they have designed the TSiBA academic programme to offer far more than knowledge transfer and that the experience integrates personal development with business learning. It also provides a wide variety of experiential learning opportunities through co-ordinated internships, mentorship, leadership, entrepreneurship and career management programmes that are core to the institute’s degree offering. “Our relatively small student numbers and extensive networks enable us to ignite a world of opportunity for each individual who studies with us. This model facilitates the development of well-rounded, emotionally intelligent graduates. “Our unique ‘Profile of Graduateness’ places attitude at the heart of a student’s development and layers skills and knowledge around this. We seek to ensure our students are equipped not only for further study and the working world, but are also provided with practical opportunities to incubate and manage businesses while studying,” she says. Central to what the work the ladies set out to accomplish in terms of giving back to the South African community in an appropriate way, black economic empowerment is one topic that does not go unmentioned. “Basically, the thing around black business is that so many businesses are looking for scorecards at the moment and no broad-based entity can really offer them an innovative solution in all the areas including skills development and integrated development. That’s exactly where we come in,” Whitehead says. Because they produced a replicable training model and made a success of the institution, they could take TSiBA forward, despite the lack of government funding. Their dream for the future is to grow TSiBA to the extent that it will branch out to the rest of Africa. When commenting on the participation of women in business and society, both Marais and Whitehead say they have noticed an encouraging trend regarding the overall performance of the women enrolled at the institution. “We have monitored this statistic for years now and the male/female ratio continues to pivot around 50/50. 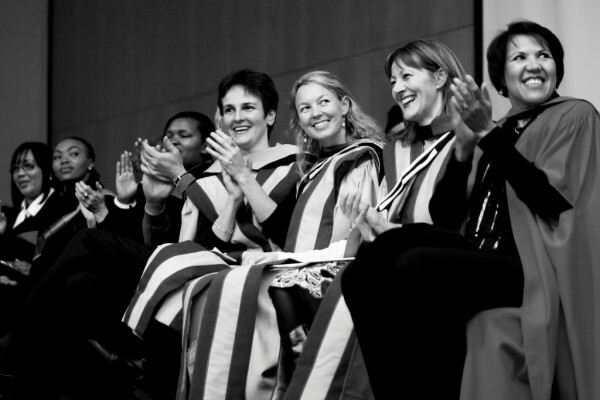 What we have noticed, though, is that the success rate of our female graduates has improved – something that may well be attributed to the fact that we have strong female leadership and role-modelling in the organisation,” Marais says. She says women have much to offer society and business by simply embracing their role in a way that exudes confidence and authenticity. “I think the biggest gift a strong female leader can give business is to proudly be the woman she is. To act, think, decide and deliver like a woman. With the focus on the lack of representation of women in leadership roles, many women try too hard to be ‘just as good as’ and ‘just like men’. Both Whitehead and Marais agree that if women want to succeed in business and leadership, they need to be strong and believe in who they are. “My advice would be to stop looking around, worrying what people may or may not think about who you are, whether you are a woman, white, black, fat or thin. Those superficial observations disappear after the first meeting. Ultimately, it is results, consistency and talent that build respect and trust,” Marais says. “I would add that women bring their passion to business. Women need to be brave, persevere, willing to take risks, see themselves as equal and ensure they have the right knowledge to back it up. Most importantly, it is important to have balance in your life, as you need to look after yourself, too,” Whitehead concludes.